Cookies, cookies and more cookies!! 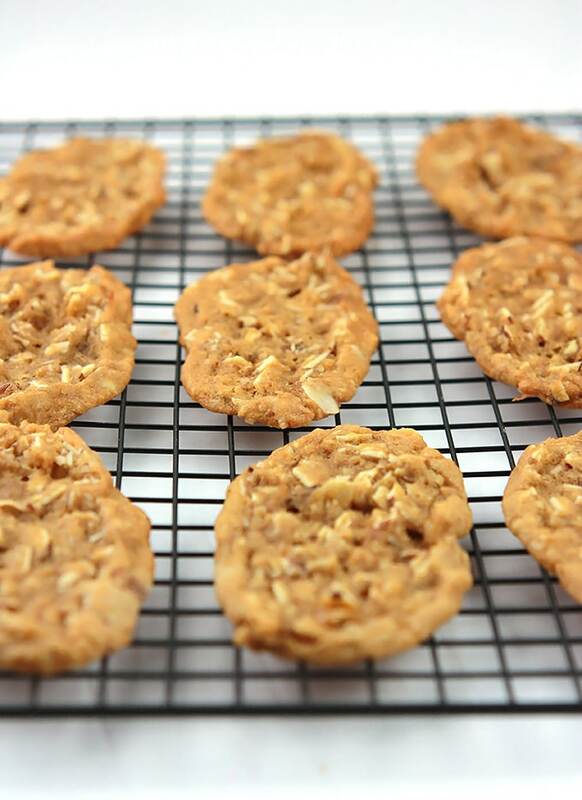 Get inspired from all the delicious recipes in this years Great Food Blogger Cookie Swap. Happy Wednesday!!! 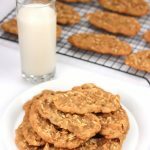 I’m so excited about today’s recipe because it’s more than just a simple cookie recipe, it’s a cookie recipe that I shared with three bloggers in this year’s Great Food Blogger Cookie Swap. 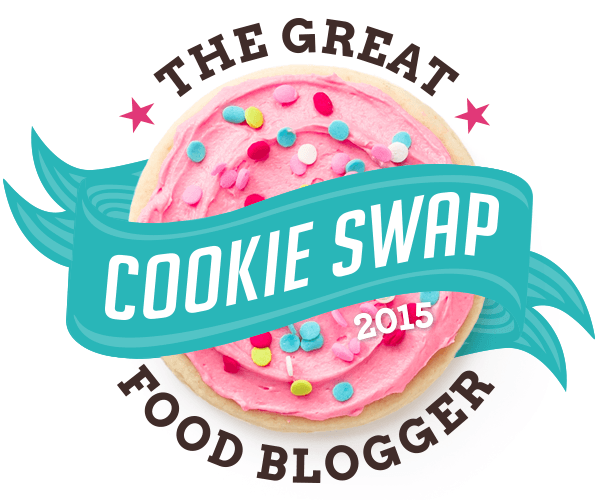 What’s the Great Food Blogger Cookie Swap? Well it’s a way for food bloggers all over the world to share their favorite cookies with each other and it all benefits Cookies For Kids’ Cancer a non-profit organization which funds therapies that help fight pediatric cancer. After registering we all received information for three food bloggers from around the country. We send each blogger a dozen delicious cookies, so I received three dozen of the most delicious cookies from three different bloggers. 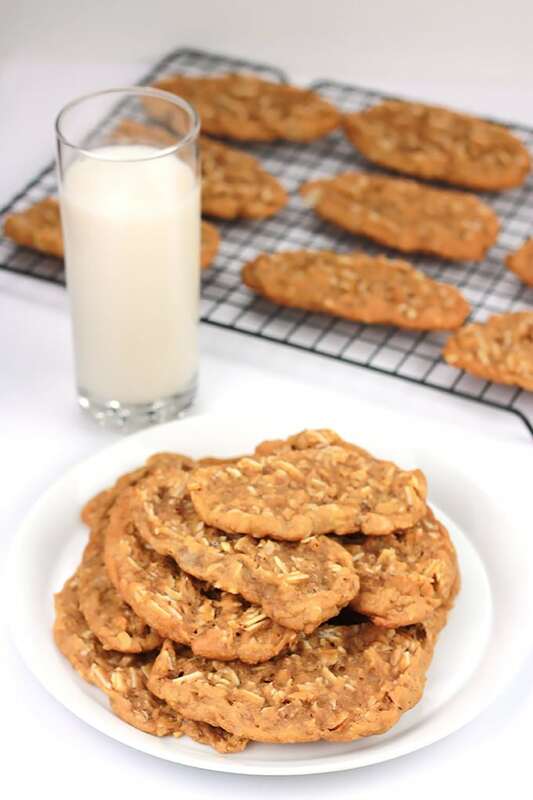 We were paired based on dietary preferences, my three bloggers were dairy-free or vegan eaters, so I made a super simple, oh-so-delicious vegan cookie filled with coconut and almonds. It all comes together pretty quickly, mix the wet ingredients together and add in the dry, the hardest part is waiting for the dough to harden in the fridge and I highly recommend overnight. 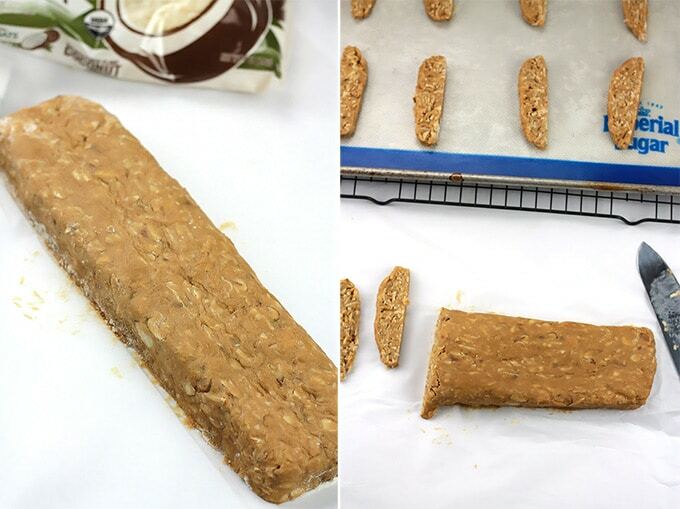 When shaping the dough it’s your choice but I shaped mine into a long rectangle. Once they are out of the oven it’s so hard to not eat everyone of them, oh they are so oh, my, my delicious! I sent cookies to Kristen @Dinner for Two Blog, Kristina @Cucina Kristina and Abby @The Frosted Vegan, please check them out. Now to the delicious cookies I received from left to right. Vegan Snickerdoodles from Rachel @The Delicious Balance, Raspberry Swirl Cookie from Shannon @Killer Bunnies, and Cardamom Snickerdoodles from Beth @Eat Within Your Means. They were all so delicious, I had to hide them from my daughter. Check their blogs for the recipes. 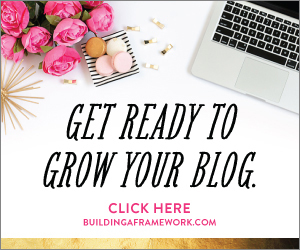 I had so much fun participating in this years Great Food Blogger Cookie Swap, if you are a blogger and interested in participating in next years swap visit the official Great Food Blogger Cookie Swap site and sign-up for notifications. 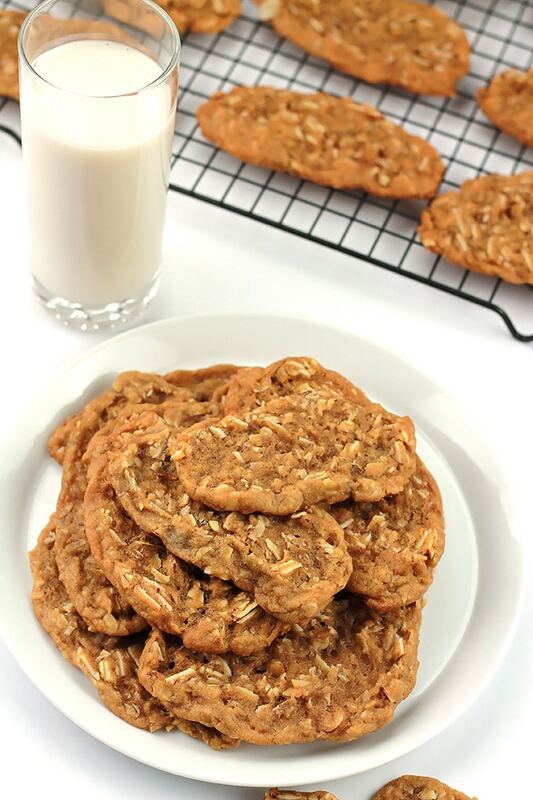 Check out the host Love and Olive Oil and The Little Kitchen for this years roundup of spectacular cookie recipes, and heat up those ovens and get busy baking! In a medium bowl mix together Earth Balance, sugars, almond extract and almond milk until well combined using a hand mixer. In a smaller bowl combine the flour, baking powder, baking soda and salt. Slowly mix flour into wet ingredients until flour is well incorporated. 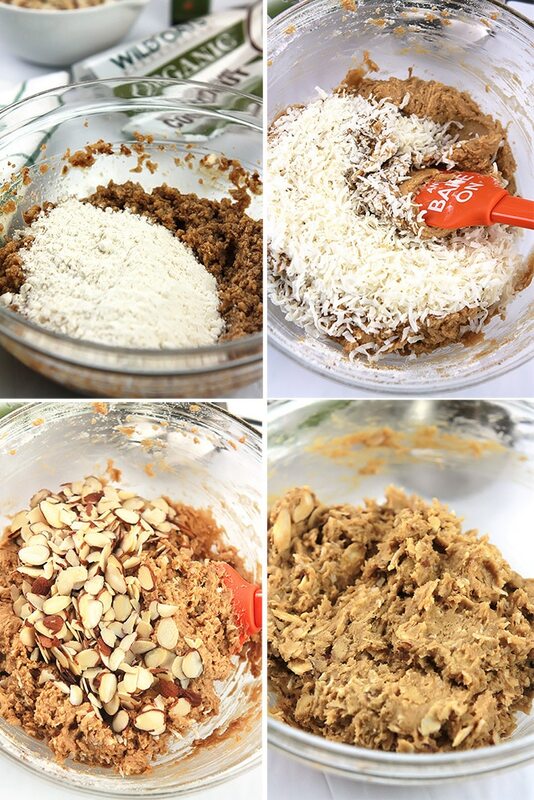 Fold in coconut and sliced almonds one at a time. Transfer dough to parchment paper and shape the dough. 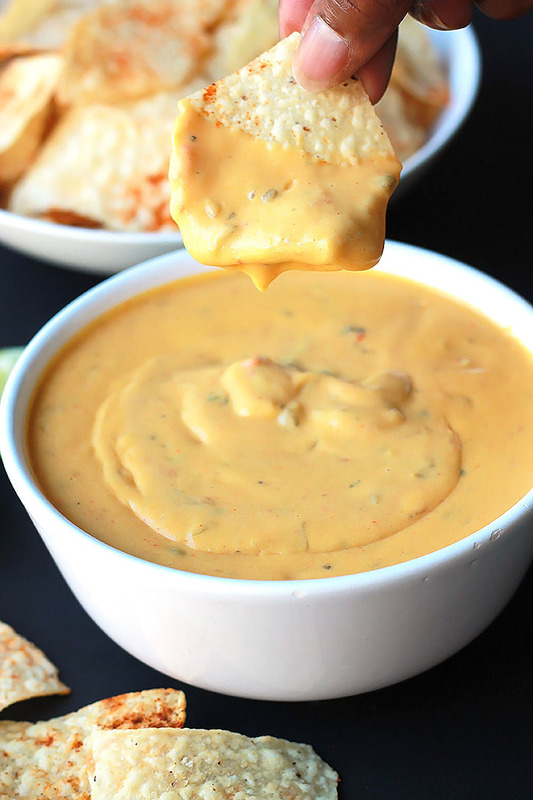 Wrap and place in fridge for 2 to 3 hours or overnight. When ready to bake, pre-heat oven to 350 degrees, slice cookie dough and place on a parchment lined or silicone lined baking sheet. Bake 8 minutes, allow to cool slightly before removing from pan. 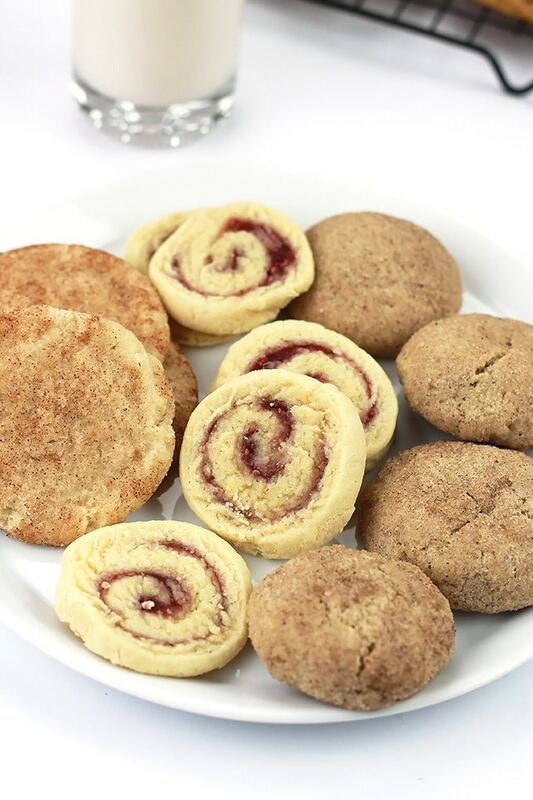 Enjoy cookies alone or with a nice glass of milk of your choice. SN: I’m not vegan, I’m vegetarian. But I cannot stand eggs. The taste, the smell, etc. This is why I’m so intrigued with vegan baking.